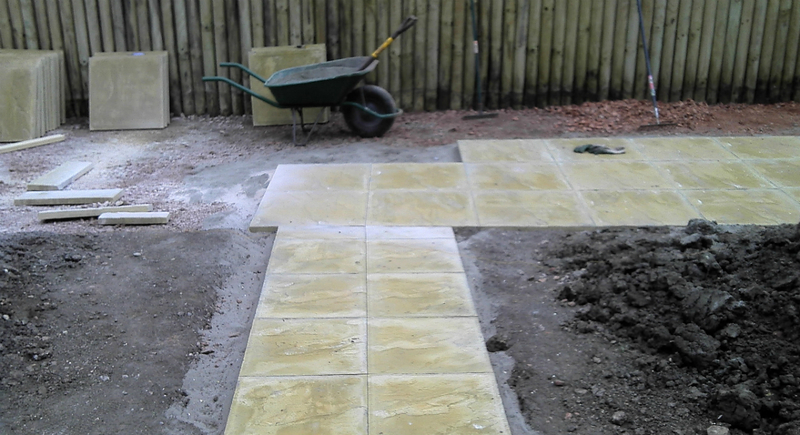 Calne path and patio. | Create Landscaping Calne path and patio. For this project our client required us to lay a 900mm wide path, leading to the new patio of approximately 24m2 which we were also going to lay for them. We estimated that this job would take two people three days to complete. Our first job was to dig out the path, not only ensuring that we had got the width correct, but also making sure it was deep enough to take the scalping and the mortar. Once the path had been dug out we laid scalping and levelled it out before compacting with whacker plates. This will give us a good solid base to bed down the paving slabs with a mortar mix. We followed the same procedure for the patio area, taking care to level the ground properly before compacting well with the whacker plates. The ground has now been well prepared for the laying of the slabs. The weather has been very favourable and at this stage we are very much on schedule. As you can see from the pictures above and below, good progress is being made with the laying of the slabs for both the path and the patio.Great care needs to be taken on getting the tiles level, as it is very difficult to correct once they have been set in the mortar mix. We are still on track with this project leaving ourselves a day to complete some of the more awkward shaped slabs that need cutting to complete this job. Below are some pictures of the completed job. We must confess we ran over a little time wise, but this was due to how the log roll along the edge of the patio had been installed, (which incidentally was not put in by Create Landscaping Ltd). This caused a few problems but after a bit of head scratching our team found a solution which enabled us to complete the job to the satisfaction of our customer. Our client was very happy with the finished job and the workmanship of this project, infact his exact words were..." I did not even realise that the patio had been done as the overall cleanliness of the site was cleaner than before you started." This is the kind of comments we strive to achieve. Our aim is always to give the customer the garden they desire and a positive experience in achieving this. It just amazes me how level you manage to get the slabs. I tried laying a path using paving slabs in my own garden, I thought it would be easy, I was wrong. I spent hours trying to get each slab level then within about a month the slabs were totally uneven. Guess thats why you are Landscapers and I am not . Great Job!